World War I was a watershed, a defining moment, in Armenian history. Its effects were unprecedented in that it resulted in what no other war, invasion, or occupation had achieved in three thousand years of identifiable Armenian existence. This calamity was the physical elimination of the Armenian people and most of the evidence of their ever having lived on the great Armenian Plateau, to which the perpetrator side soon gave the new name of Eastern Anatolia. 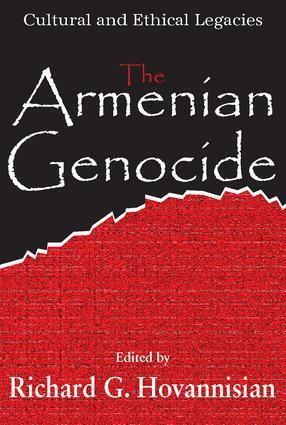 The bearers of an impressive martial and cultural history, the Armenians had also known repeated trials and tribulations, waves of massacre, captivity, and exile, but even in the darkest of times there had always been enough remaining to revive, rebuild, and go forward.This third volume in a series edited by Richard Hovannisian, the dean of Armenian historians, provides a unique fusion of the history, philosophy, literature, art, music, and educational aspects of the Armenian experience. It further provides a rich storehouse of information on comparative dimensions of the Armenian genocide in relation to the Assyrian, Greek and Jewish situations, and beyond that, paradoxes in American and French policy responses to the Armenian genocides. The volume concludes with a trio of essays concerning fundamental questions of historiography and politics that either make possible or can inhibit reconciliation of ancient truths and righting ancient wrongs. The Armenian Genocide: Wartime Radicalization or Premeditated Continuum? Can Memory of Genocide Lead to Reconciliation?